This week we are looking at the whole spectrum of the arts and today we focussed on comedy and comedy performance. This morning we were treated to a show featuring three great performers compered by UK based Australian comedian Bec Hill. 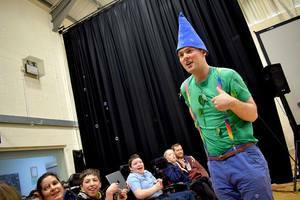 The staff and students really enjoyed the acts, with Tom Veryzer aka Twig the Pixie, Sarah Bennetto and Jay Foreman performing. After lunch the comedians held a number of stand-up workshops, passing on their skills and also giving the students an insight into their craft. Also today classes have been busily working on their classroom challenges. This year marks the 500th anniversary of the death of one history’s greatest geniuses, Leonardo Da Vinci. As our theme for Creative Arts Week is ‘Discover, Innovate, Create’ we set our classes the challenge of creating a piece of art based on Leonardo’s works. All will be revealed on Friday.